At first reading, this dish seems like a lot of work, but it really isn’t. Once the lamb is in the oven there is little to be done until it is cooked. Just enjoy the superb aroma for a few hours whilst the lamb is slowly roasting. The fennel relish is deliciously rich and hot and the spinach and pomegranate salad makes the perfect partner to this rich dish. Using a sharp knife, score the skin on the shoulder of lamb all over, making sure you don’t go so deep that you cut into the flesh. Set aside whilst you prepare the rub. Warm a small, dry frying pan over a medium heat and add the fennel seeds, peppercorns and sea salt. Heat for 2 to 3 minutes, shaking the pan from time to time, until the seeds are lightly toasted and aromatic. Remove from the pan and cool slightly then bash, using a pestle and mortar, until finely ground. (I popped mine in a food processor). 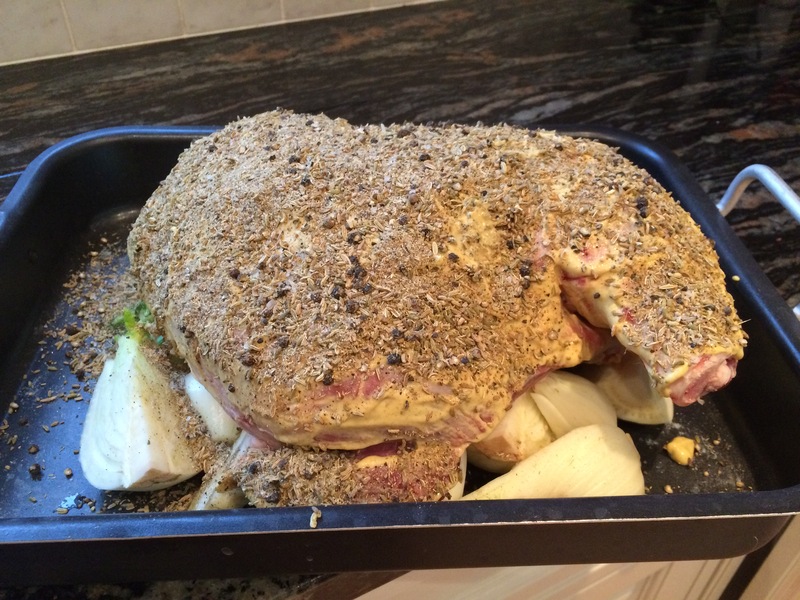 Brush the mustard all over the lamb on both sides, to coat the meat evenly and generously. Sprinkle the fennel seed mixture on top of it, rubbing and patting it into the mustard coating. 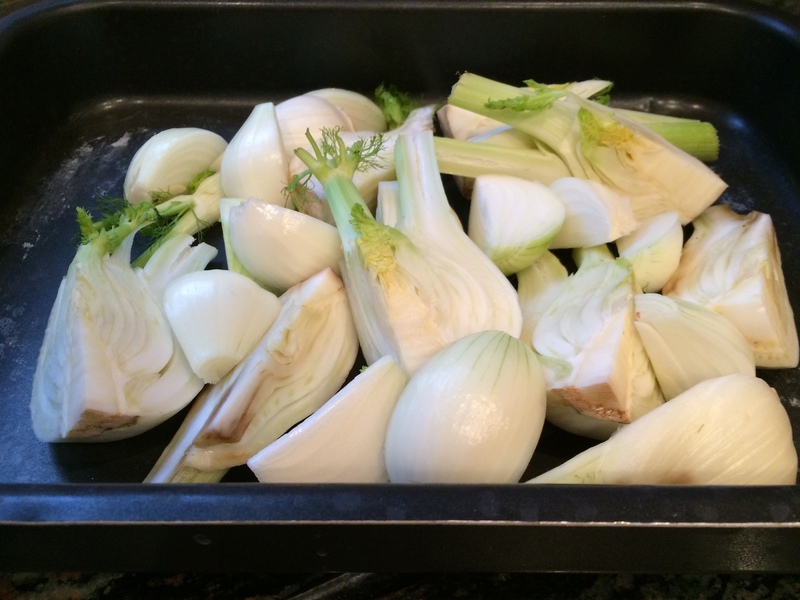 Put the fennel and onion quarters into a large roasting tin. Pour in the white wine and sit the lamb on top of the vegetables and drizzle over the olive oil. Roast for about 6 hours at 150°C, fan 130°C, gas 2 basting from time to time, until the meat is very tender and falling off the bone. Transfer the lamb to a large plate; cover loosely with foil and leave to rest in a warm place while you make the relish. Remove the fennel and onion from the roasting tin and chop to a ‘salsa’ consistency and put in a bowl with the white wine vinegar, chillies and herbs. Give the mixture a good stir and season to taste with salt and pepper. Strain off the excess fat from the roasting tin, then put the tin containing all the lovely lamb juices, over a high heat on the hob. Once the juices start to bubble away, pour in the stock to deglaze. Let it bubble for around 5 to 10 minutes until reduced and thickened, whisking frequently. If, like me, you have an induction hob, transfer the juices to a saucepan and clean the roasting tin out with the stock as much as possible, scraping up all the sticky bits. Strain through a sieve into a warmed jug. Serve the lamb whole or flaked into pieces, with the hot fennel relish and gravy. Delicious served with a spinach and pomegranate salad. Recipe courtesy of Sainsburys Magazine. 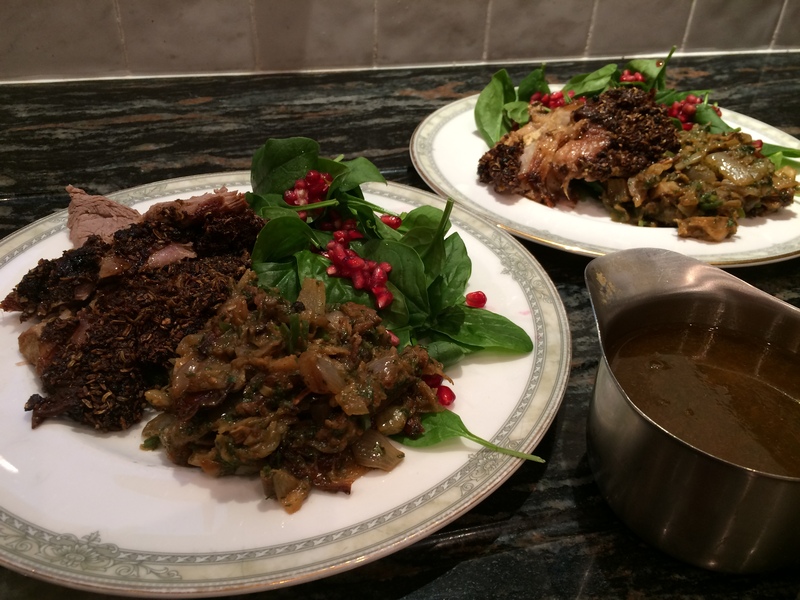 This entry was posted in Dinner, Salads and tagged Dinner, Fennel, Healthy Eating, Lamb, pomegranate, Salad, Spinach. Bookmark the permalink.